Pyretic Productions is an independent theatre company dedicated to presenting boundary-pushing contemporary theatre. The company’s work raises awareness of political and social issues that affect Canadians and international communities. Based in Edmonton and Toronto, Pyretic seeks to actively engage diverse audiences and works directly with the communities relevant to the subject matter of their plays. They are committed to thorough research and investigation as a means to authentically inspire and develop their projects. The company was founded by Matthew MaKenzie and Patrick Lundeen, who are both graduates of the National Theatre School of Canada (2009). After their second year of training, upon returning to their hometown of Edmonton in the summer of 2008, Matthew and Patrick began their partnership in theatre and produced their first play together titled ‘The Particulars’ at the Edmonton Fringe Festival under the name Pyretic Productions. The play was held over as one of the top picks of the Fringe Festival. Following graduation they worked on separate ventures. In 2013 Matthew secured a spot in the Fringe Theatre Adventures Performance Series, and reconnected with Patrick back in Edmonton. Impressed by her ability to produce and promote her projects, the two invited Lianna Makuch to join the company for the project as an additional Artistic Producer. The three artists have now co-produced numerous professional works: including Sia (2014); Bears (2015); The Particulars (2015); The Other (2016); and Blood of Our Soil (2018). 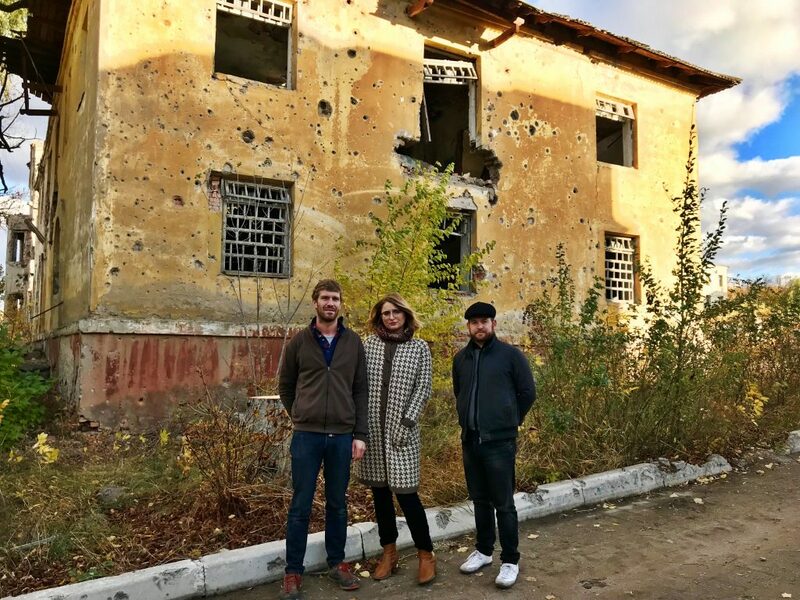 Company members Patrick Lundeen, Lianna Makuch, and Matthew MaKenzie in Slovyansk, Ukraine. Pyretic Productions has produced critically acclaimed, award-winning work nationally and internationally. Toronto productions have included Sia by Matthew MacKenzie, The Particulars & In General by Matthew MacKenzie (Summerworks, 2011), Sudden Death by Charlotte Corbeil-Coleman (Next Stage Festival 2013) and The Other by Matthew MacKenzie (with Company Blonde Dance Projects, 2016). Alberta presentations include Sia by Matthew MacKenzie (2013), The Particulars by Matthew MacKenzie (Edmonton Fringe 2008, 2013), Bears by Matthew MacKenzie (2015), The Other by Matthew MacKenzie (2016), and Blood of Our Soil by Lianna Makuch (2018). The company has been nominated for several Sterling Awards and their production of Bears received the Sterling Awards for Outstanding Choreography, and Sound Design. Blood of Our Soil was nominated for 4 Sterling Awards, including Outstanding New Play and Outstanding Independent Production.In 2015, they were accepted to the United Solo Festival Off Broadway in New York and presented their production of The Particulars as part of the festival. In March of 2019 the company will be premiering Lianna Makuch’s heart-rending and haunting new play Blood of Our Soil in Toronto at the Tarragon Theatre. The project is being presented in partnership with Edmonton’s Punctuate! Theatre.